Hazel Carbaugh Obituary - Shippensburg, Pennsylvania | Fogelsanger - Bricker Funeral Home, Inc. The Memorial Candle Program has been designed to help offset the costs associated with the hosting this Tribute Website in perpetuity. Through the lighting of a memorial candle, your thoughtful gesture will be recorded in the Book of Memories and the proceeds will go directly towards helping ensure that the family and friends of Hazel Carbaugh can continue to memorialize, re-visit, interact with each other and enhance this tribute for future generations. 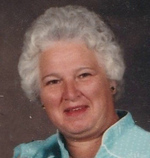 Hazel M. Carbaugh, 83, of Upper Strasburg, passed away Thursday, February 7, 2019. She was born April 3, 1935 in Bear Valley, Franklin County. Hazel was a daughter of the late Allan and Rosella Seiler Foore. She was a member of the Newburg First Church of God. In addition to her parents she was preceded in death by her husband, Paul H. Carbaugh who passed away August 3, 2008. One son, two brothers and two sisters are also deceased. Hazel is survived by one son, Steven P. (Jodi Straley) Carbaugh of Chambersburg, two grandchildren, Matthew Bryan (Janelle) Carbaugh of Shippensburg and Jessica Rose White of Chambersburg, two great-grandchildren, Landon and Addison Carbaugh of Shippensburg, one brother, Clifford Foore of Shippensburg and numerous nieces and nephews. Funeral services will be held Monday, February 11, 2019 at 2 p.m. in the Fogelsanger-Bricker Funeral Home & Crematorium, Shippensburg. Officiating will be Pastor Lawrence Metzler. Burial will be in the Emmanuel Lutheran Church Cemetery, Upper Strasburg. A viewing will be held Monday afternoon one hour prior to the services in the funeral home.